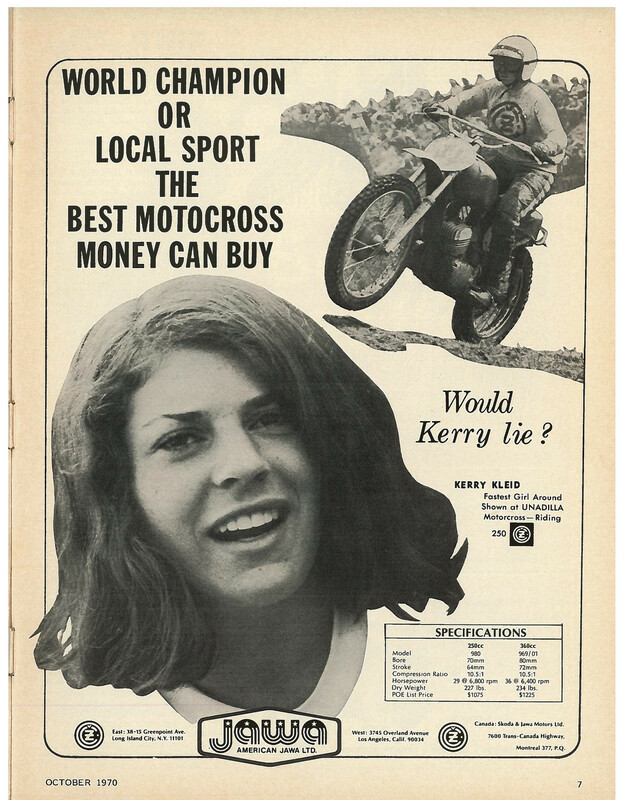 Check out this Cycle World advertisement for the woman who was an almost-forgotten pioneer in women's motocross: Kerry Kleid, the first woman to ever hold a professional license to race motocross. She hailed from New York and was highly respected on the New England circuit in those pre-AMA National, pre-women's motocross years. This ad came out after she did quite well at a 1970 Inter-Am race at Unadilla, though we doubt the exact date here was September 19, 1970. When Kleid showed up to race the first time with her license, the AMA realized for the first time that she was a girl and revoked the license. She went to court and won, forcing the AMA to give it back and allow her to race the next time at Unadilla. She didn't win, but she did well enough for a full-page ad in what was then the biggest motorcycle magazine in the world. In Europe, the powerhouse Swedish team topped the powerhouse Belgian team at the FIM Motocross des Nations at Maggiora, Italy. Ake Jonsson and Bengt Aberg went 1-2 in the first moto, then Arne Kring, Jan Johansson, and Christer Hammargen went 3-7-5 in the second moto to knock off at the Red Knights lineup of DeCoster, Geboers, Rahier, Teeuwissen, and Van Velthoven. Team USA, which was undermanned at the previous Trophee des Nations, did not participate. Yamaha's Broc Glover won the 250cc Trans-USA opener at Mid-Ohio, outdueling Suzuki's Mark Barnett. The Golden Boy would win four of the five rounds held in the abbreviated series, as well as the title. But the opener at Mid-Ohio had a strange vibe. Glover and Barnett were multi-time champions by this point in their careers, as were Yamaha's Bob Hannah and Suzuki's Marty Smith, and Mike Bell was the previous year's AMA Supercross number one, but they were overshadowed by the real stars of the event: Team USA. The four Honda riders who just swept the Trophee and Motocross des Nations—Donnie Hansen, Danny LaPorte, Johnny O'Mara, and Chuck Sun—had just returned from their world-changing rides in Belgium and Germany. They were the stars of the opening ceremonies, as well as the favorites among the Mid-Ohio fans. The Honda riders didn't do so well—their equipment didn't show up from Europe until the day before the race—but they received a hero's welcome. Missing from the whole shooting match was a single European rider. With Roger DeCoster having retired (and helped lead Team USA) and no one else up for the challenge or expense of going to America for five races, the old vibe of the old Trans-AMA Series—the U.S. against the Europeans—was now a thing of the past. 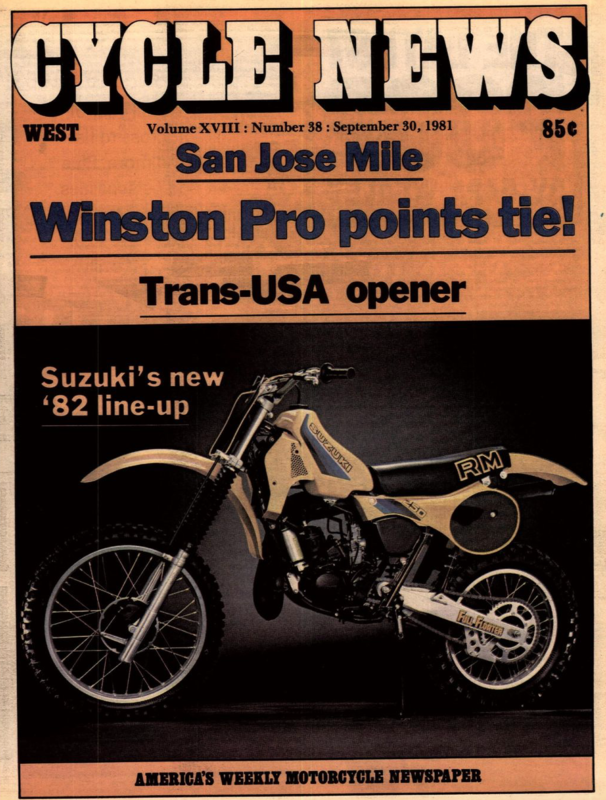 And check out the cover of Cycle News from this week in '81 with the all-new Suzuki "Full-Floater" on the front page: That's pretty much the bike Mark "Bomber" Barnett rode to win the 1981 AMA Supercross Championship!